Today's gardens bring us across the Atlantic to Berlin. Without a window box garden of her own -- but she does have a windowsill -- Leslie Kuo of Urban Plant Research shares her garden dreams as well as photos of other people's gardens. 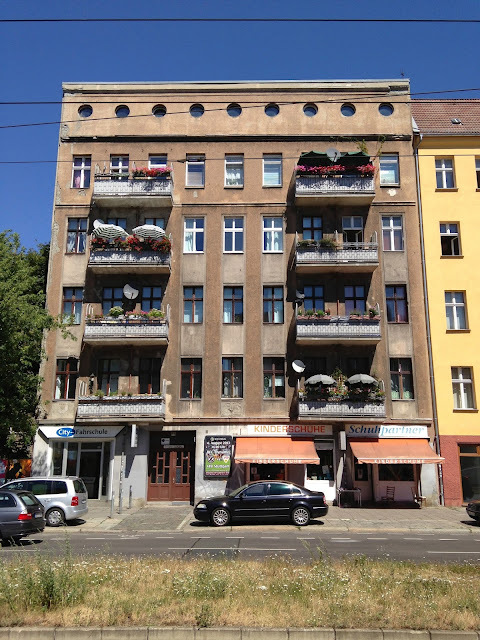 Living on east Berlin’s busiest boulevard, with no balcony and all my windows facing four lanes of heavy traffic, I tend to admire and document other people’s window boxes rather than plant my own. Besides, they’re forbidden in our building, as my landlord regularly reminds in stern letters. Between that and my wariness that the abundant car exhaust will render any edible plants (my favorite kind) unfit to eat, I tend to see the windowsill as a very temporary gardening spot, where I might sprout seeds or potatoes for a few weeks, but no more. That doesn’t stop me, however, from taking note of other plantings I admire, and tasty plants I would grow, if I had better air quality and a more relaxed landlord. Tomatoes, magically thriving within the confines of a windowsill, never cease to impress me. One apartment I pass daily has robust tomatoes in every window, every summer. Nearer my studio, a mix of tomatoes, peppers and petunias share one box. In my own vegetable window box, I would probably also mix tomatoes with peppers, such as jalapeños or habeneros. I’d have a herb box too. There’d be classics like basil, flat-leaf parsley and chives, of course. But also summer savory: called Bohnenkraut (bean herb) in German because it complements green beans. I’d grow borage for its cucumber flavor and edible blue flowers. I might try those flat Chinese garlic chives again, though I had no luck last time – sometimes chives need a couple years to get going. And I’d keep some apple mint, in its own pot so it can’t take over the whole window, for sun tea. If I had room for a flower box, I’d grow nasturtiums for their funny umbrella leaves, edible flowers (pretty on salads) and their dangling habit. And maybe even some geraniums, as clichéd as that may be, for their wonderful smell. A box of vegetables, a box of herbs, a box of flowers… and if I had a balcony, I’d fill a strawberry barrel of tiny, white wild strawberries from runners collected in the forests outside the city. Hey, an urban plant lover can dream! Thank you to Leslie for this photo-essay. I especially like the compositions of bicycles and plants. Nice post! Thank you so much for sharing this post with your readers. Urban plant loving is what it's all about. Since I've been following this blog, I discovered that I've never eaten insects and a couple other things, but I love to have some potted plants around the house. Even a lot of my neighbors insist on having a nice vegetable garden inside or out, or on the balcony like you mention. The best thing about it is that they're very adaptable to growing in containers, so long as you give them the right amount of sun. Here in St. Louis, most people talk about growing tomatoes; I suppose because you don't need the sun to grow them. One year, I remember growing some Jalapenos in the back yard and they wee as hot as can be - even without the seeds! Thanks for sharing the post -- and dang, you've been to a lot of places.